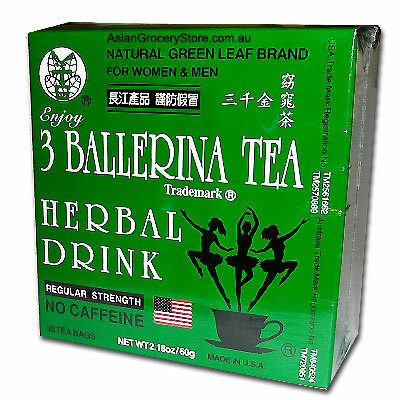 Minimum quantity for "3 Ballerina Tea Dieters Herbal Drink" is 1. This special formular herbal drink is all natureal tea. Delightful for both woman and men. Suggested Use: Brew one tea bag in a cup (300mL) of boiling water for 5 minutes. Honey many be added to sweeten the taste. Store in a cool and dry place away from moisture. Warning: Pregnant women or Nursing Mothers & Children under 12 years of age should not drink this product.